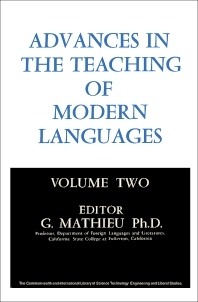 Advances in the Teaching of Modern Languages is a compilation of essays that addresses such issues as the development made in using machines as instructors in language education. A section also highlights the effectiveness of machines in teaching humans a certain language. Essay such as Oklahoma Revisited features the experimental teaching machine named the AVID. The book also contains essays that expound on the necessity of retaining human instructors in the language department. A section discusses the importance of training the foreign language teachers. Methods that improve the ability of the teachers to effectively teach the students are enumerated. Aspects of the language such as phonetics, phonology, graphemes, lexical variation drills, and audio- lingual techniques are covered. The text will be a useful learning tool for primary and secondary instructors who teach English and other foreign languages. The book will also benefit researchers and professionals in the field of language education.